The Lope: Do We Really Want to Lose This? At least every few days, I check Route 66 News to see what's happening on ye ole Mother Road. The news is usually quite interesting. Once in awhile, though, it's alarming. Such is the case with the latest on El Vado, a pretty little Albuquerque motel with an uncertain fate. I shot this is in about 2004. Even as pixels on a screen, it's a glorious bit of neon. Bask in it. It's the kind of sign you often see referred to in books in the past tense and wish it were still in place. It can be in place, along with the classic motel to which it belongs, if people speak out now - and you're one of them. There will be a public hearing conducted by the Albuquerque Landmarks and Urban Conservation Commission on Wednesday, November 14 - a hearing that may save or seal the fate of El Vado by ruling on two questions. 1. Should the El Vado be designated a City Landmark? 2. Should the owner’s request for a Certificate of Appropriateness to demolish it be approved? Yes, "demolish." The owner wants to tear the place down. This was taken on my last pass through Albuquerque on March 22 of this year. Even behind an ugly fence, the place conveys charm. The motel, actually a motor court, dates from 1937 and according to Preservation, the magazine of the National Trust for Historic Preservation, was declared a Historical Landmark in 1993. "Listing in the National Register is one of the City's criteria for designating landmarks locally. That helps get the City Landmark designation but NR listing offers no inherent protection when a private owner proposes demolition with his own funds." So how does such a property end up in this dilemma? 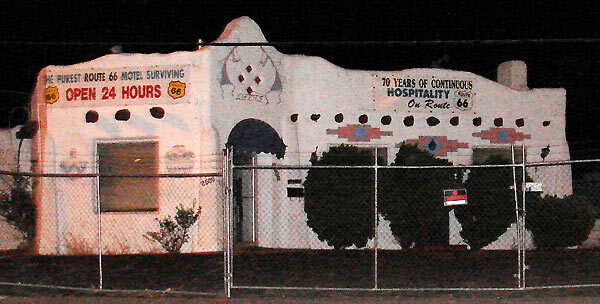 "El Vado Motel was purchased in late 2005 by Richard L. Gonzales, who stated to Albuquerque media that he wished to tear it down and built luxury townhouses there. 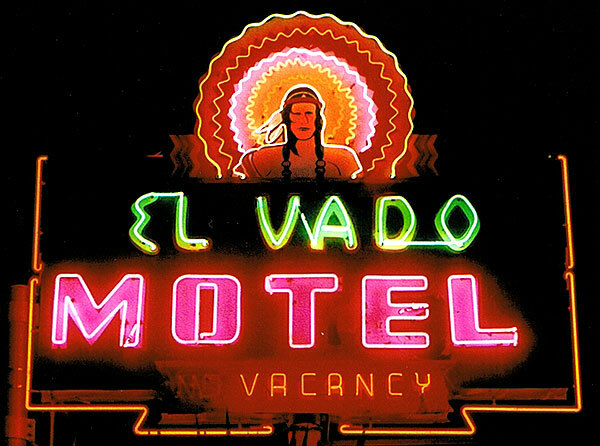 City officials, preservationists and Route 66ers opposed the development because El Vado remains one of the oldest and most distinctive motels on the Mother Road. 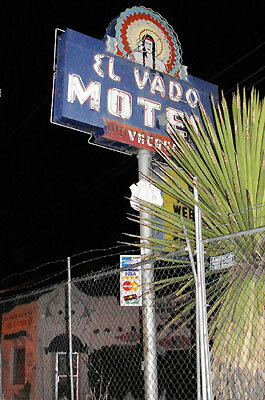 The city designated El Vado a city landmark in 2006, thus giving it more protection. However, the designation was overturned on appeal because of a technicality. So El Vado's application for city landmark status has been resubmitted, which the Landmarks and Urban Conservation Commission will decide on Nov. 14. It's been reported that the city has been negotiating with Gonzales about a possible buyout of the property. Albuquerque Mayor Martin Chavez has said, as a last resort, the city will seize the property to prevent its destruction. It's been a long and sometimes frustrating process to keep this old motel standing. But the Route 66 community has played a vital role in preventing El Vado's destruction so far, and it may yet again. With luck, El Vado will be operating as a business again in the future." So, November 14, we should see a decision on whether to restore the buildings city-landmark status, as well as a decision on a demolition permit. Remember, when Gonzales purchased the property, it was already an official Historical Landmark. He should not be someone who purchased a property and was blind-sided by opposition to the idea of destroying it. He knew what he was getting. Reliable reports indicate the place is in decent shape, so demolition is not logical. We can voice our concerns. E-mail or write to Charles Price, Chairman, and Members, Albuquerque Landmarks and Urban Commission, c/o Maryellen Hennessy, City Planning Department, P.O. Box 1293, Albuquerque NM 87103. I spoke with Ed Boles via telephone Monday, and he said that although earlier emails are preferable, that emails and letters could be accepted up to 48 hours before the hearing, so that's sometime on November 12 in the afternoon. There is really no reason to wait, though. Please support the efforts of preservationists. Remind the commission that short-sighted mistakes lead to long regrets. Many of our cherished motels (all three wigwams, for example) once had a state of decay and were brought back. Every town has tales of what was once great and is now lost - and in most cases the loss was avoidable. Remember that we lose our cultural character not so much in big chunks but by erosion here and there - by letting go of puzzle pieces like the El Vado that fill in the details of who we once were. And if you've spent your tourist dollars to sleep and sup in Albuquerque in order to see all that Route 66 neon, of which the El Vado is part, it wouldn't hurt to remind them of that, too. "Agenda Item 4: The Landmarks and Urban Conservation Commission voted 7-0 to recommend that the City Council designate the El Vado Auto Court/Motel as a City Landmark. Agenda Item 5: The Commission deferred the El Vado owner's request for a Certificate of Appropriateness to demolish the El Vado until after the City Council's decision in the matter is final." The Albuquerque City Council has to approve the designation. I'll update this post when I know more. Update: the council approved the designation, but not by much. But now, it may be time to send emails again; and by noon on February 11, 2008, at that. See Route 66 News. Passed by El Vado Motel Thursday, July 2nd. SAD state of irony that such a historic motel is boarded up. What is the current situation with the motel??? ?